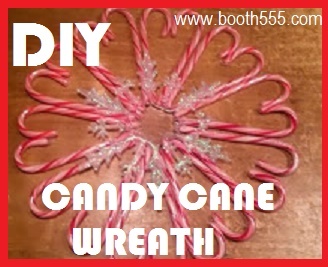 Here's a cute candy cane wreath I made and the instructions are below. I first saw this idea when my Aunt sent me a link on fb. Then I did a quick search and found it on Pinterest here. It looked super cute to be so simple that I just had to try it! First I headed down to the Dollar General Store to buy the candy canes, it takes 22. So I had to buy two boxes. 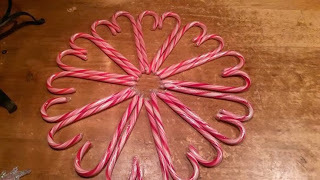 And I needed something roundish to decorate the center and try to hide where they all come together. I didn't see anything I loved so I drove over to the Dollar Mart. And there I found the cute, clear and silver snowflake! It is simply PERFECT! Then I got all my stuff together when I got home. 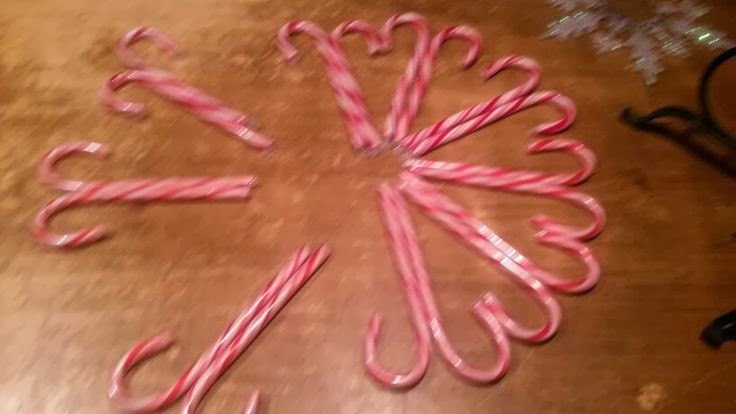 And then just shove them together to form a "wreath" circle. Okay, next, after doing all 22 of these like that. 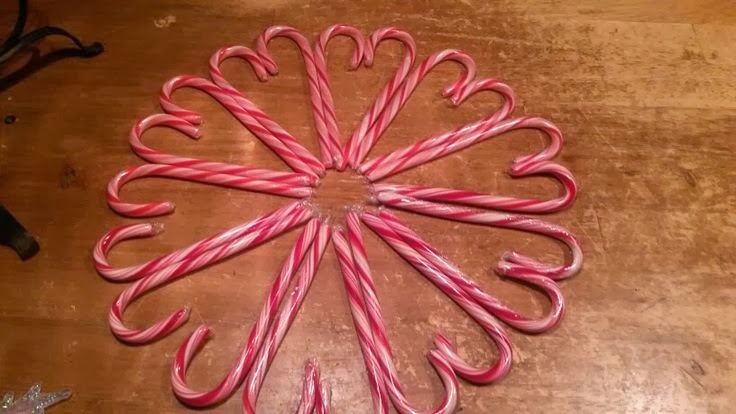 I arranged them all into a circle again, and took my hot glue gun and glued them all together at the inside center circle. Each one to the next, to make a tight hold. 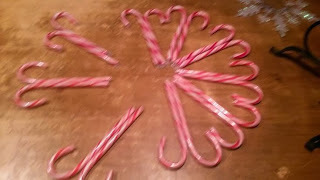 I also did this to the top outer parts, where the canes form a heart shape. Just to make a stronger hold. 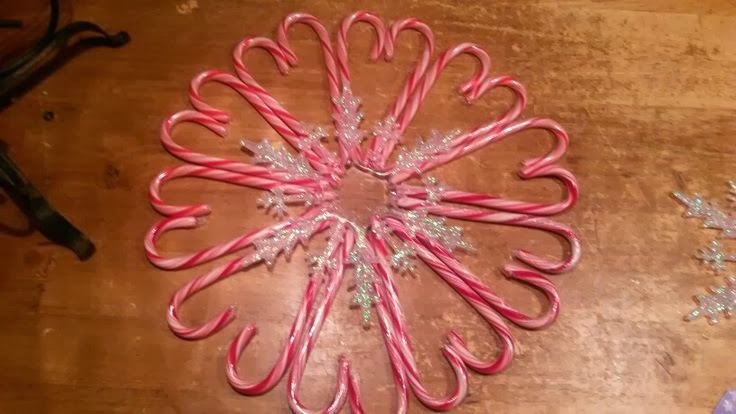 And then I got my plastic clear, sparkly snowflake and glued it directly onto the center of the candy canes with my E6000 glue, found in the craft section of stores. I'm sure you could probably just hot glue the star on, but I wanted to make sure it wouldn't fall of soon. Now this e6000 glue takes a while to fully dry, but when it does, it has a strong hold! Now you could finish up here, if you didn't want to take it a step farther like I did with the photo insert. 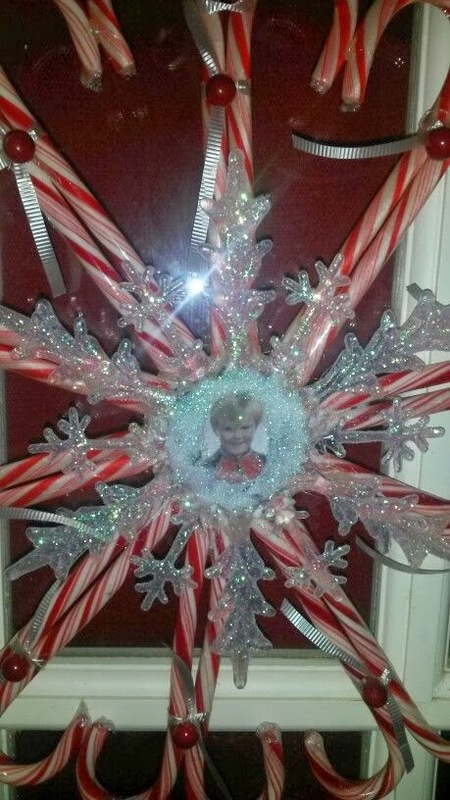 But since my Aunt had sent me a photo wanting this, and she recently had a son to pass away in a car accident. I thought I'd add a photo of him in the center for her. It'd be a great way for her to have his photo around during Christmas. 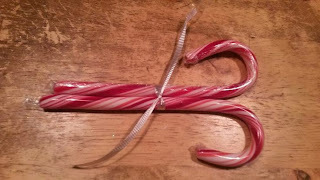 And he use to always steal her candy canes off her Christmas tree too. So this is extra special for her. I chose a photo from when he was younger and printed it off. 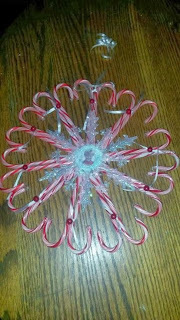 I then glued the edges of the photo to the inside of the clear snowflake, from the back side. 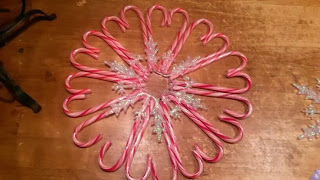 I also smeared some extra glue around the edges on the inside and sprinkled all kinds of sparkly, white glitter in it. 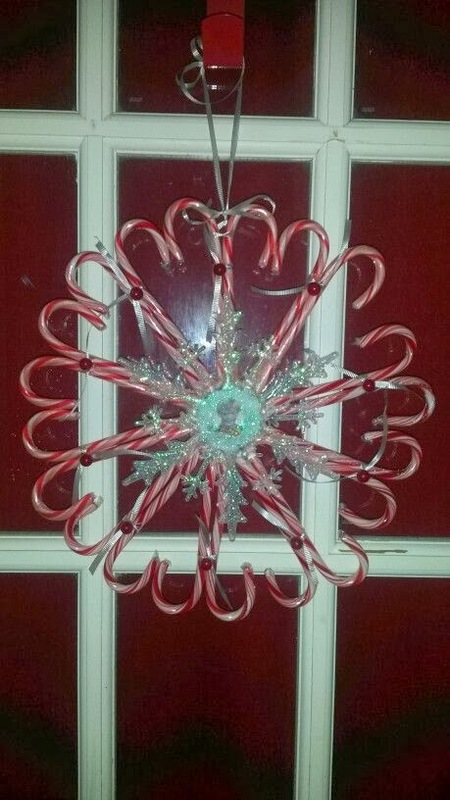 I thought it was a good way to hide the edges of the cut photo, since the center of the snowflake was clear. Also, this is where I found some little red pip berries in my craft box, and hot glued them to the white ribbon ties. 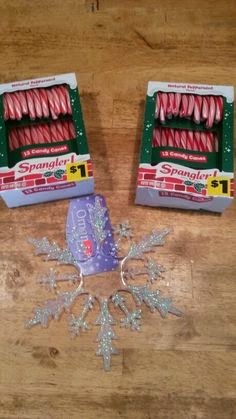 You could use jingle bells, little fake presents or bows. Just about anything to dress them up a bit. 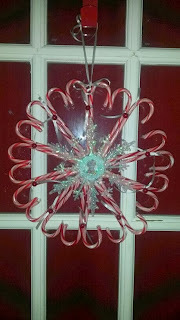 And lastly, the final step was to simply add a piece of ribbon to the top, to be able to hang it by. And that is all there was to it! 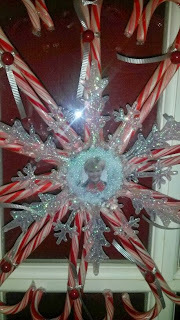 My Aunt loves it and it is a great way for her to keep her son's spirit around at Christmas. And by typing out these steps, it makes it seem way more complicated than it is. Believe it, it's simply tieing two candy canes together, hot glueing them and assembling it all. If you do give this a try, I'd love for you to send me a link or photo of it! I gave this one to my aunt but I'm making more that's on the way to my Craft Booth #555 where they can be purchased as a great, unique gift!